Chakra is a Sanskrit word for ‘Wheel’. It refers to the energetic wheels of energy that is spinning throughout our body that helps to regulate all its process, from the function of our organs to the immune system and emotions. There are 7 main Chakras, which are positioned from the base of your spines to the crown of the head. Each Chakra has its own colour, vibrational frequency and corresponds to the main systems of the body. The 7 Chakras are namely, Root/Base, Sacral, Solar Plexus, Heart, Throat, Third Eye, Crown. If a Chakra becomes blocked, energy cannot flow and it throws you off balance. Vibrational Sound healing has been practiced since ancient times. Everything in our universe is made up of vibrations, and the Crystal Singing bowls work directly with this energy and channel it into our body, thus allowing us to remember our connection to Source and heal at a deeper level. Research has shown that sound can redress imbalances on every level of physiologic functioning. Each Crystal bowl is different in terms of tones, chakra centres and healing properties. you may feel the effects in certain sections of your body more than others, but the vibrating sound will travel throughout your entire energy field to address any imbalance or blockages of the energy channels. In this session, Jaslyn would be playing her 7 Singing bowls, the Triple Heart Morganite and Emeral Alchemy Bowl, the Grounding Mother of Platinum Alchemy Bowl, the balancing Platinum Alchemy Bowl, the Calming Ocean Indium Alchemy Bowl, a Yagna Alchemy Bowl and a frosted Throat Chakra and a frosted Sacral Bowl during the session. Participants can choose to lie down on yoga mats or sit up on bean bags, whichever is more comfortable for them as Jaslyn cleanse and balance your Chakras. 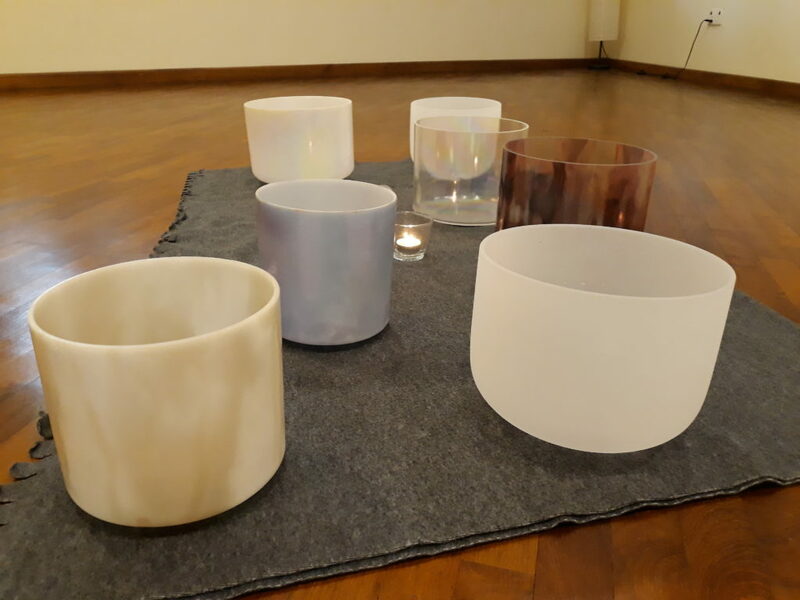 Calm yourself from the hustle and bustle from your everyday life and immerse in the delightful tones and healing vibrations from the Crystal Singing Bowls. Let your body relax, recharge and rejuvenate in this soothing session. All are welcome, no prerequisites, booking is recommended. Please be on time! Thank you for your understanding.